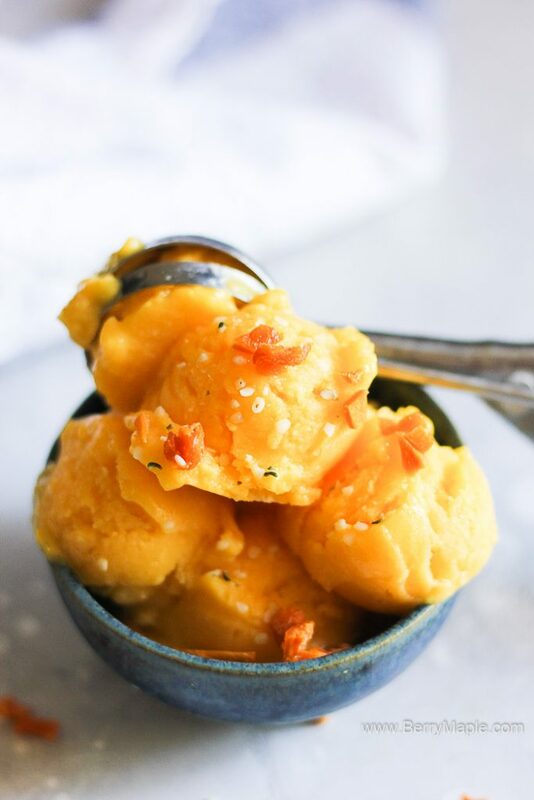 Sweet refreshing refined sugar free mango sorbet is an incredible kid friendly dessert and a healthy alternative to your regular ice cream! Its amazing how simple it is to create a delicious recipe using just 3 ingredients and without any refined sugar! We love to use local honey in every recipe that calls for one. Support your local farms! 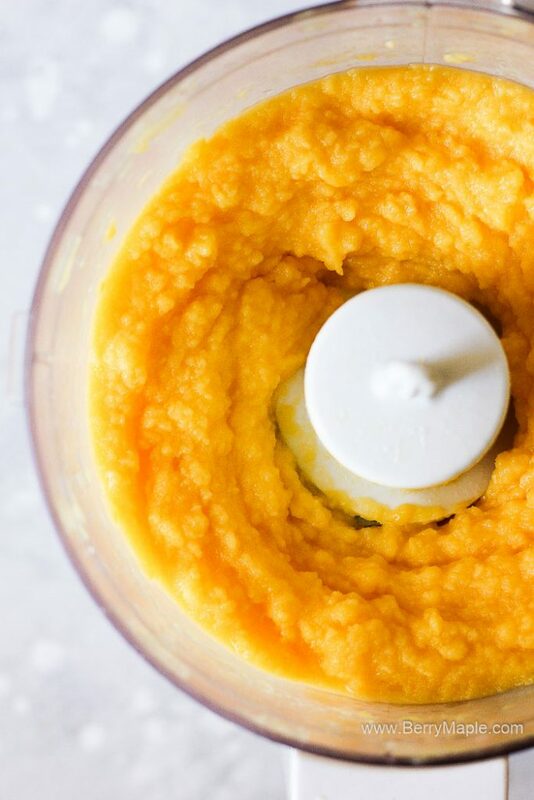 For the sorbet you need to blend all the ingredient until it become a thick paste. If you dont like or eat honey, please use maple syrup instead. I froze it in just a simple soup bowl, but for your convenience please freeze sorbet in a wide container. It will help with scooping it out. 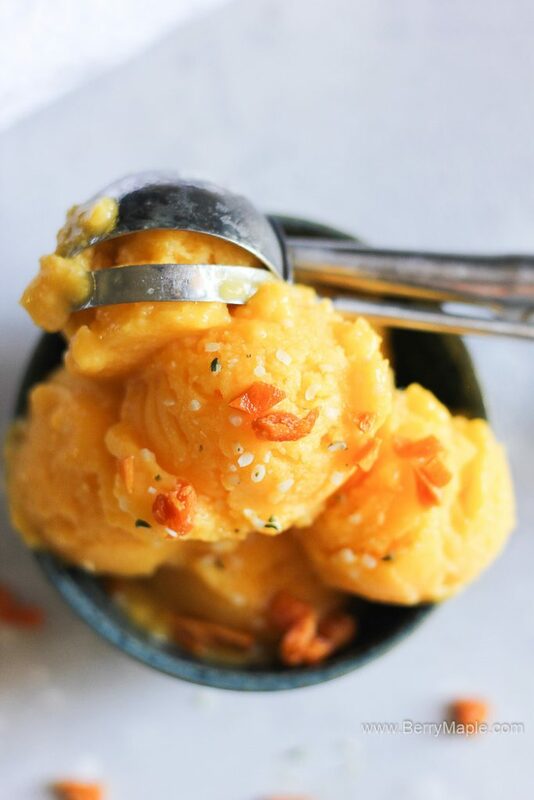 This Mango Sorbet is vegetarian and refined sugar free. Absolutely perfect for little kids and adults. Refreshing, energizing and vitamins filled! Scoop the sorbet out of the container and serve. Sprinkle with chopped dried mango or nuts and and your favorite seeds. I have everything to make this! Too bad my kids are gone this week… I’ll be enjoying it all to myself! I bet this is delicious! Honey is my favorite non-sugar sweetener! So vibrant! What a great summer dessert, especially for entertaining – so interesting and easy to make. This is absolutely the best! 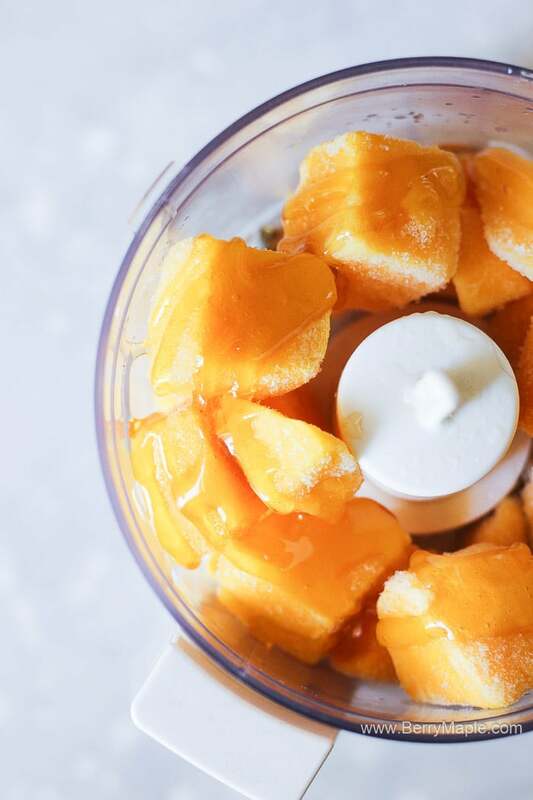 Thank goodness mangos are on sale right now, because we could absolutely go through a batch of this every day! LOVE Mango!! Cannot wait to make this easy recipe!! So refreshing and simple! These sound amazing! I love that you put some toppings on yours too. That’s how I like to enjoy sorbet and ice cream. This sorbet is SO gorgeous! 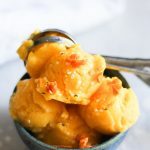 I love the color and I love using mango in my recipes too. 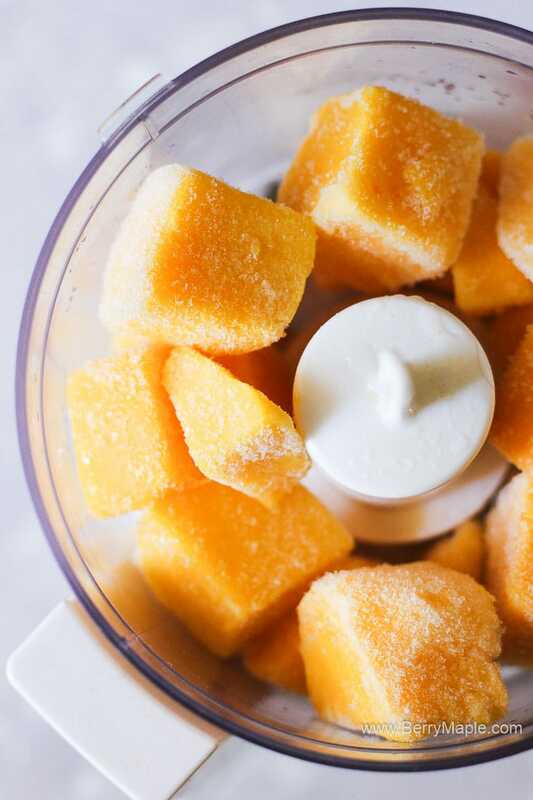 I can’t wait to make this sorbet! 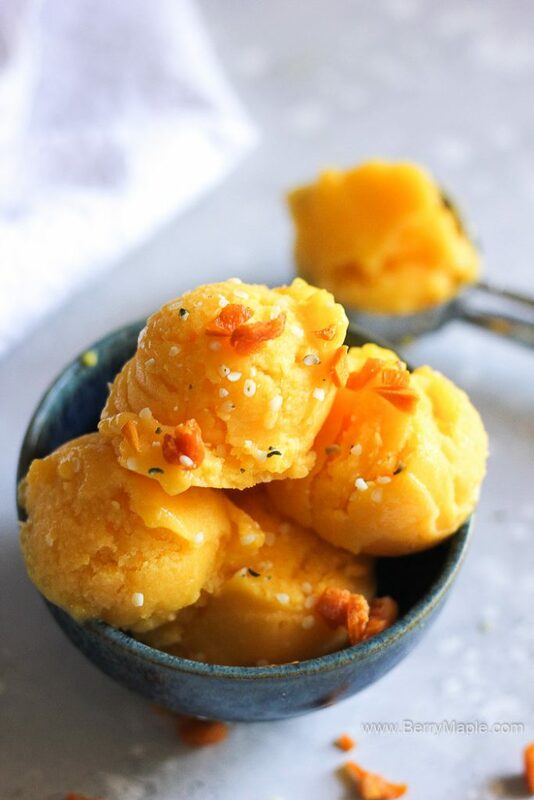 Love how simple and easy this mango sorbet is to make. So full of flavor for a hot summer day. Mangoes bring back so much nostalgia of my time as a Peace Corps volunteer. I can’t wait to try this recipe. Such an easy special treat I can make my girls without feeling guilty about a bunch of sugar and additives! Thank you! This looks so refreshing for the intense heat we’re having right now! Also just love the bright sunny color too! Absolutely stunning, this color!! And only 3 ingredients, that’s pretty cool! What an amazing recipe. My oldest son is a mango (and honey) fanatic. He will LOVE this! Love that this has so little added sugar and it looks so refreshing and delicious. The weather is still sweltering when I am, so this sounds perfect to me! Mango is my favorite fruit! This looks amazing! so simple and easy and nourishing! LOVE!